There is no doubt, Pohorje trails deserve to be among my favorite routes. Maribor is a lucky city to have such a magnificent mountain right at its feet. World cup skiing slope and mountain bike tracks, numerous skiing centers, ancients forests, rich wildlife, waterfalls, high moors, lakes, mountain cottages and vineyards are just some of Pohorje's jewels. Every part of Pohorje has something magical and it is difficult to express the calm that overwhelms you on a tour through its vast forests or just a walk around high moors or lakes. Mountain and cycling tours to and through the Pohorje forests are my favorite summer activities on this beautiful mountain. The most popular is a 50 mile tour across Pohorje that takes 4 days. Summer time around the end of August and the beginning of September is the best time to do it but spring time around May is absolutely magical because of the snow that still covers the highest points of the mountain. With plenty of mountain cottages around a tour like that is really pleasant. 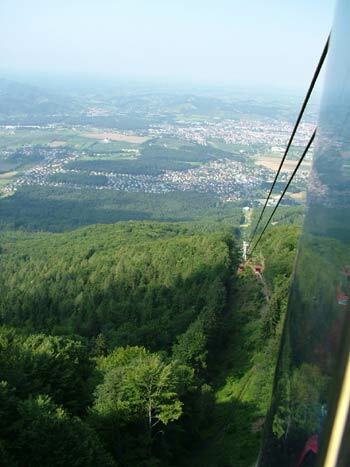 A good 1 and a half hour walk to the top of Pohorje is a favorite exercise for many but sometimes time is a bit tight so a popular cable car becomes a good alternative. However, the top of the mountain is where my favorite route really begins. reaching the top of Pohorje. Mountain cottages are very well placed and they are mountainbikers' and mountaineers' favorites. They offer simple but really cheap accommodation, good food with various stews being the favorite dish among visitors. 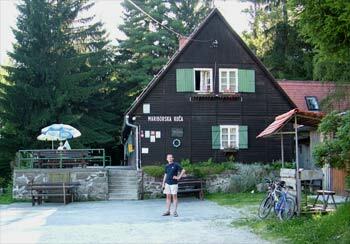 Mariborska koca (koca=cottage is pronounced co-cha) is the first one on the favorite route No. 1. The cottage is very popular among daily visitors because it is just a 15 minute walk from the upper cable car station. 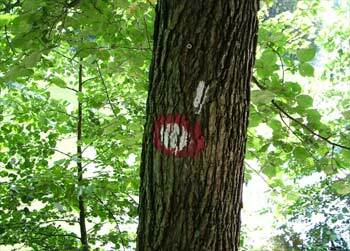 Slovenian mountain routes are all brilliantly signposted with a simple yet easily visible blazes (white dot in a red circle). The current blaze was developed by a famous Slovenian mountaineer Alojz Knafelc in 1922 and is prescribed by the Slovenian Law of Mountain Trails. This is one of the reasons Slovenian mountains are among the most popular in Europe. is a typical simple Pohorje mountain cottage. that starts in Maribor and leads across Pohorje. 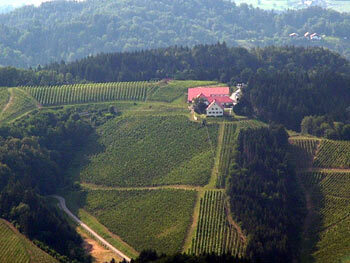 Apart from ancient forests, lakes and other natural wonders we often visit Pohorje's meticulously maintained vineyards. A walk through Meranovo estate is surely one of my husband's favorite routes. The estate is owned by the University of Maribor, and used for research and education purposes but they welcome visitors on regular food and wine tasting events. However, Meranovo is not a commercial estate so we normally have to pre-arrange the visit (TEL: +386 (0)2 61 32 211, +386 (0)51 348 689 or e-mail: peter.kramer@uni-mb.si). at Meranovo estate is a definite must do. There aren't many cities that would have such a magnificent mountain on their doorsteps. Maribor is one of them and its people are rightly proud of their Pohorje. World cup skiing, world cup mountain biking, dozens of moutain cottages, brilliantly signposted trails, adrenaline parks, sky diving, ancient forests and many other attractions are a magnet that can hardly be resisted if at all.